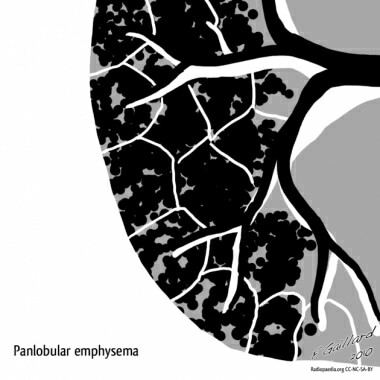 Emphysema is pathologically defined as an abnormal permanent enlargement of air spaces distal to the terminal bronchioles, accompanied by the destruction of alveolar walls and without obvious fibrosis. 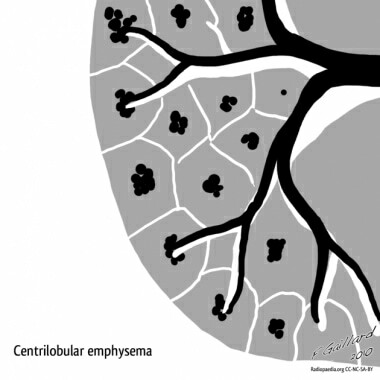 Clinically, the term emphysema is used interchangeably with chronic obstructive pulmonary disease, or COPD. The latest systematic review looked at the impact of air pollution on COPD sufferers (inclusive of articles prior to 1990); the investigators concluded that the need to continue to improve air quality guidelines is more important than ever as biomass cooking in low-income nations was clearly associated with COPD mortality in adult female nonsmokers  . Genetic risk factors for the development of COPD are also thought to exist. The most well-studied is alpha-1-antitrypsin (AAT) deficiency (also known as alpha-1 antiprotease deficiency). AAT is a glycoprotein member of the serine protease inhibitor family that is synthesized in the liver and is secreted into the blood stream. The main purpose of this 394–amino acid, single-chain protein is to neutralize neutrophil elastase in the lung interstitium and to protect the lung parenchyma from elastolytic breakdown. 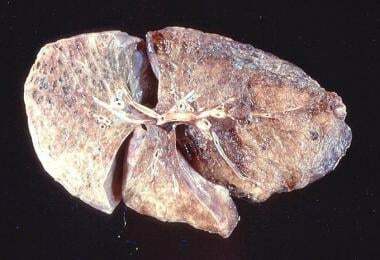 If not inactivated by AAT, neutrophil elastase destroys lung connective tissue leading to emphysema. Therefore, severe AAT deficiency predisposes to unopposed elastolysis with the clinical sequela of an early onset of panacinar emphysema. Once innate respiratory defenses of the lung’s epithelial cell barrier and mucociliary transport system are infiltrated by foreign/invading antigens (noxious cigarette ingredients, for instance), the responding inflammatory immune cells (including polymorphonuclear cells, eosinophils, macrophages, CD4 positive and CD8 positive lymphocytes) transport the antigens to the bronchial associated lymphatic tissue layer (BALT). It is here where the majority of the release of neutrophilic chemotactic factors is thought to occur. Proteolytic enzymes like matrix-metalloproteinases (MMPs) are mainly released by macrophages, which lead to destruction of the lung’s epithelial barrier. 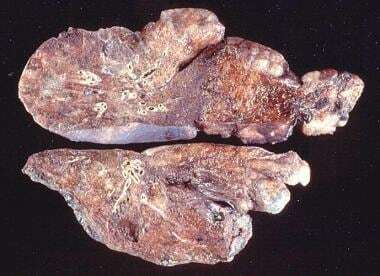 Macrophages are found to be 5- to 10-fold higher in the bronchoalveolar lavage fluid of emphysematous pateints. Also, along with macrophages, the release of proteases and free radical hydrogen peroxide from neutrophils adds to the epithelial ruination, specifically with emphasis on the basement membrane. This is why neutrophils are thought to be highly important in the pathogenesis of emphysema at the tissue level, a differentiator to the mainly eosinophilic inflammatory response in airways affected by asthma. 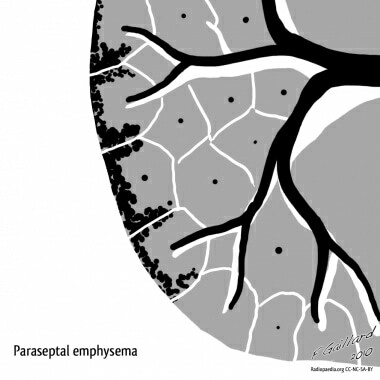 The repair process of airway remodeling further exacerbates emphysema’s anatomical derangements with key characters such as vascular endothelial growth factor (VEGF), which is expressed in airway smooth muscle cells and is responsible for neovascularization and expression of increased and possibly abnormal patterns of fibroblastic development. It is these structural changes of mucus hyperplasia, bronchiolar edema, and smooth muscle hypertrophy and fibrosis in smokers’ airways that result in the small airways narrowing of less than two millimeters. The National Health Interview Survey reports the prevalence of emphysema at 18 cases per 1000 persons and chronic bronchitis at 34 cases per 1000 persons. While the rate of emphysema has stayed largely unchanged since 2000, the rate of chronic bronchitis has decreased. This prevalence is based on the number of adults who have ever been told by any health care provider that they have emphysema or chronic bronchitis. This is felt to be an underestimation because most patients do not present for medical care until the disease is in its later stages. A widely used simple prognostication tool is the BODE index, which is based on the BMI, obstruction (FEV1), dyspnea (using Medical Research Council Dyspnea Scale), and exercise capacity (ie, 6-minute walk distance). A US Centers for Disease Control and Prevention (CDC) Morbidity Mortality Weekly Report study of the National Vital Statistics System reported an age-standardized death rate from COPD in the United States for adults older than 25 years of 64.3 deaths per 100,000 population. This rate varied by location, with the lowest rate in Hawaii (27.1 deaths per 100,000 population) and the highest rate in Oklahoma (93.6 deaths per 100,000 population). For patient education resources, visit the Lung Disease and Respiratory Health Center. Also, see the patient education articles Cigarette Smoking and Emphysema. Patients with COPD may develop substantial decreases in nocturnal PaO2 during all phases of sleep but particularly during rapid eye movement sleep. These episodes are associated with rises in pulmonary arterial pressures and disturbance in sleep architecture initially, but patients may develop pulmonary arterial hypertension and cor pulmonale if the hypoxemia remains untreated. Therefore, patients who have a daytime PaO2 greater than 60 mm Hg but demonstrate substantial nocturnal hypoxemia should be prescribed oxygen supplementation for use during sleep.